The article describes modifications to the effector of a manipulator arm proposed in order to increase the accuracy of jaw force measurements. Gripping force measurement is performed using strain gauges. Their proper positioning and connection minimize not only the influence of the position of the centre of gravity of the manipulation object on the jaws but also the effect of temperature changes around the measuring area. 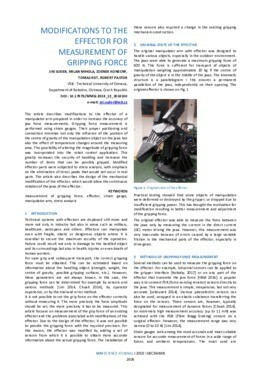 The possibility of altering the magnitude of gripping force was incorporated into the robot control application. This greatly increases the security of handling and increases the number of items that can be possibly gripped. Modified effector parts were subjected to stress analysis, with emphasis on the elimination of stress peaks that would not occur in real parts. The article also describes the design of the mechanical modification of the effector, which would allow the continuous rotation of the jaws of the effector.